It follows a High Court ruling yesterday concerning the law governing suspended sentences. 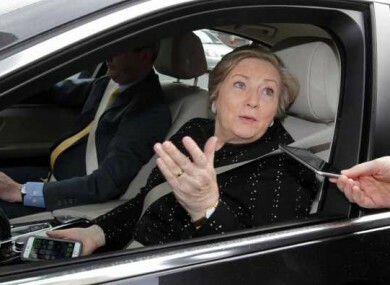 MINISTER FOR JUSTICE Frances Fitzgerald has insisted that the government still has the power to introduce emergency legislation should it be required. It follows a High Court ruling yesterday in which certain aspects of the law governing for suspended sentences were ruled unconstitutional. It is expected the decision will have serious implications for the Irish criminal justice system. As the issues in question are likely to lead to court challenges it would not be appropriate to make detailed comment on the judgement. However, there are no grounds for believing that persons generally who had not raised the issue in the course of proceedings which have been concluded now will be able to benefit from the finding of the High Court. While legislation cannot retrospectively affect criminal cases before the courts, if, in light of the consultations with the Attorney General, it is concluded that amending legislation is necessary, this can be introduced in the Dáil very quickly – if necessary within days. As of yesterday a law that gives the courts the power to activate suspended sentences has been voided. Section 99, the relevant piece of legislation, was ruled by Judge Michael Moriarty to be unconstitutional. Speaking on RTÉ’s Morning Ireland, senior counsel Paul Anthony McDermott explained that the piece of legislation was introduced as part of the Criminal Justice Act in 2006 and it formalised the process for reactivating a suspended sentence. The issue arises as that person is unable to appeal their conviction for a second offence, as they will be jailed for the suspended sentence held over from their first conviction – something that Judge Moriarty ruled unfair. “I suspect what will happen in practice is that a lot of sentence hearings will be adjourned to see if emergency legislation is passed,” he went on. Following on from Minister Fitzgerald’s comments, Sinn Féin leader Gerry Adams agreed that the Dáil in its current state is able to pass laws. “The Dáil can sit and pass laws,” he said. So too can the current Seanad, which is still in place until next week so there’s nothing, for example, to prevent the Oireachtas from also debating and voting on emergency legislation to deal with the result of the High Court judgement yesterday on suspended sentences. Email “Dáil can act "very quickly" to fix Section 99 problems, minister insists”. Feedback on “Dáil can act "very quickly" to fix Section 99 problems, minister insists”.